IDF confiscates inciting materials at PA universities, Hevron printing house, amidst celebrations over anniversary of Hamas' founding. IDF forces from the Etzion, Binyamin, and Yehuda brigades as part of the IDF's battle against incitment on Wednesday night carried out three separate operations. In preparation for the events celebrating the anniversary of Hamas' founding, the IDF forces raided Birzeit University in the Palestinian Authority (PA) town of Birzeit and Al-Quds University in the PA town of Abu Dis. 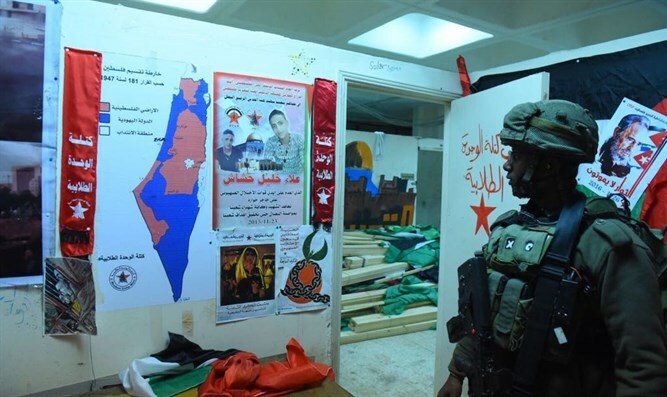 In Hevron, the forces also raided a printing house and a center for the dissemination of terror-inciting materials, confiscating inciting announcements, flags, posters, and other inciting materials. Also on Wednesday night, Border Police, Shabak, Israel Police, and the IDF arrested eight wanted terrorists in Judea and Samaria. All of the arrested are suspected of being involved in terror activity and violent disturbance of civilians and security forces. They have been taken for interrogation.